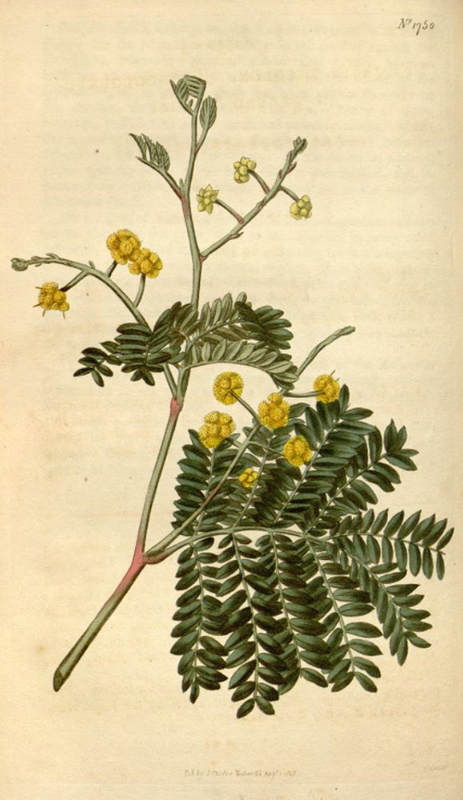 Hortus Camdenensis | Acacia terminalis (Salisb.) J.F.Macbr. ‘This elegant plant was one of the earliest that was introduced from NSW, having been raised from some of the first seeds which were brought home from thence.’ [LBC no.601/1822]. ‘Flowers in all seasons. Propagated by cuttings. Introduced in 1788, by the Right Hon. Sir Joseph Banks.’ [BM t. 1750/1815]. ABR pl.235/1802. Listed in the 1850 and 1857 catalogues [T.7/1850]. Widespread on sandstone in the Sydney region [Beadle, FNSW] and probably collected locally. Acacia discolor Whitley ex Steud. 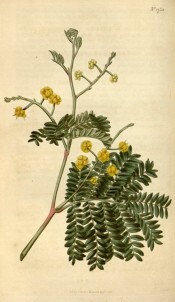 (1840) = Acacia prismatica Hoffmans. It seems likely that Macarthur collected native species as much to barter with his overseas contacts as for decorating his own garden.